The International Bareboat Skipper course is a five day course. It is not for beginners and the recommended entry level requirements are a VHF maritime radio operators certificate, and to have logged over 200 nautical miles and 10 days at sea before advancing to this level. The recommended minimum age to obtain this certification is 18. Candidates who do not have 200 nautical miles may take this course and gain miles required to obtain certification during the course. Those who have obtained the International Bareboat Skipper qualification, can automatically obtain the “International Certificate of Competency” (ICC), provided the student meets the requirements as laid down by the United Nations Economic Commission for Europe (Resolution 40). Please click this link for more information. IYT’s International Bareboat Skipper Sail Certificate covers command of a sailing vessel with a sail area of greater than 80 square metres/861 square feet. Please see the official statement here. As you advance and become more proficient as crew or skipper you take on bigger challenges that require proper training to ensure the safety of your family and friends. The bigger the boat or length of adventure the more training you require. Most of us prefer to spend our time on the water and not in a classroom. To facilitate this, IYT has a series of E-learning courses available for the theoretical part of sail and powerboat training. If possible take a prep course online for you next level of training. Plan your training at one of our many schools worldwide. Book in advance with your school as class sizes and availability may be limited. Review the IYT course progression details to learn about professional level courses. Spend time on the water and properly log your seatime. The Boating Lifestyle is one of the most rewarding pursuits available. There is something physically and emotionally invigorating when you are offshore. To enjoy the experience fully you need the proper training & skills to be safe, prepared and command a vessel. 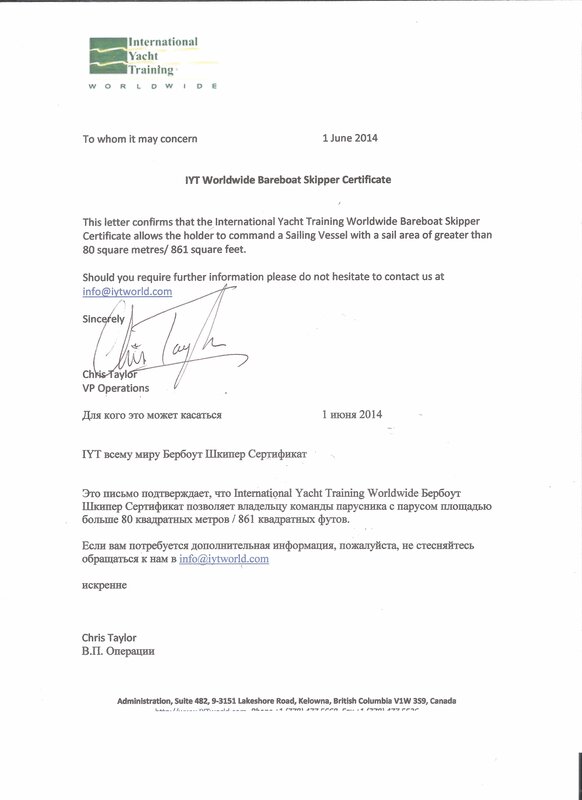 IYT is the largest provider of crew and skipper certificates for the recreational yachting industry in the world. Learn more about the benefits of an IYT Certificate. For many IYT certificates, there is the need to re-qualify for your certificate every 3 to 5 years. This ensures that our certifications are meeting international standards. The IYT Passport is recognized in over 40 countries around the world and offers you an opportunity to study and train worldwide. A beginner at sailing or operating a powerboat should be familiar with the training path that is available from IYT. Many recreational boaters progress to become crew on superyachts.